← Introducing Zayzelle. Dress Simply. Made in Oaxaca. Designed in North Carolina. 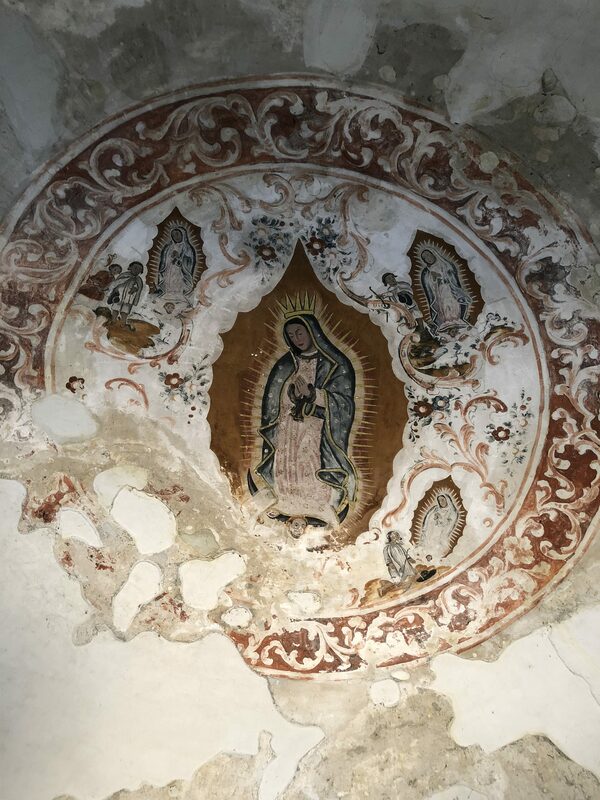 San Miguel del Valle, Oaxaca, calls to me. 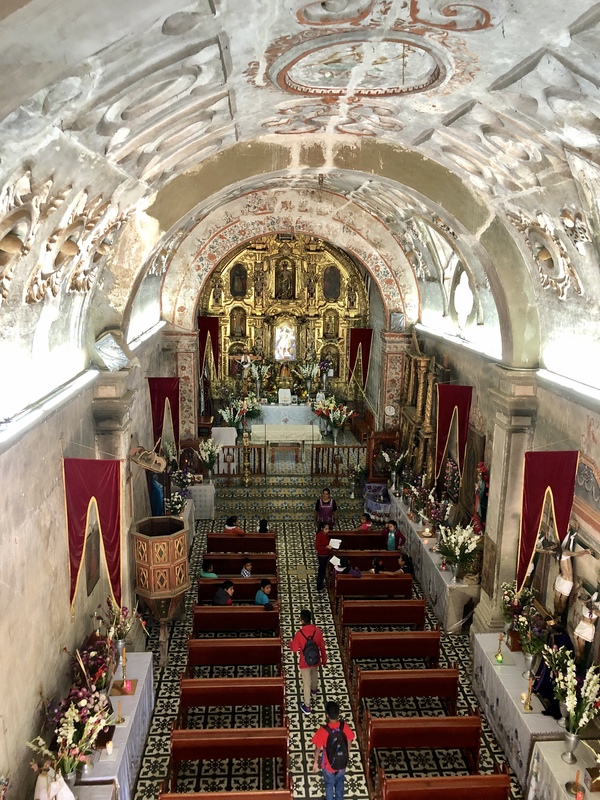 Perhaps because it is hidden — escondido — beyond Santa Ana del Valle and Diaz Ordaz, tucked into the fold of the foothills leading to the Sierra Juarez on the way to the eco-tourism center of Cuajilomoyas. There are dazzling, artful aprons there that talented women embroider with birds, flowers, animals, and plants in a cascade of color. Wearable art! It is all from their imagination. There is no design that shows up twice. 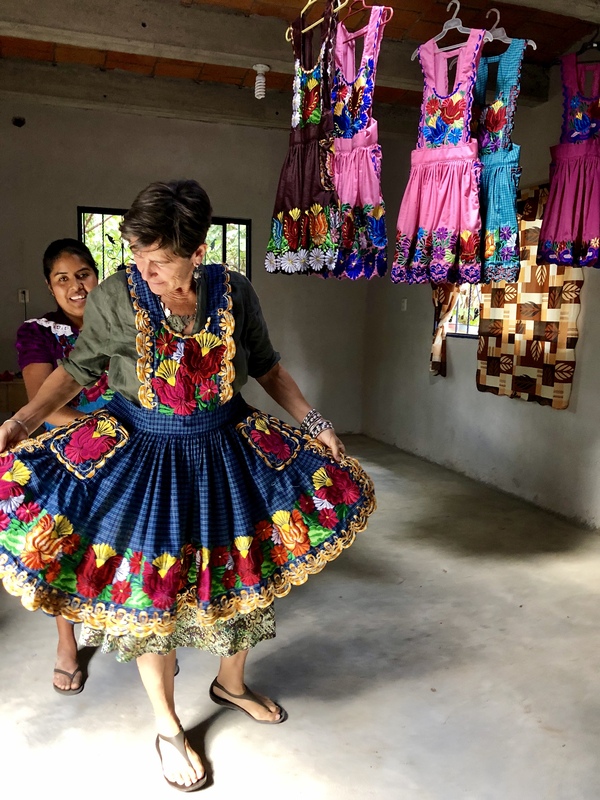 You can find them from this distinctive dress each Sunday at the Tlacolula Market, a 15-minute trip from the village. I went back last week with my young friend Lupita. She rarely leaves Teotitlan del Valle and its a big world out there along the Pan American Highway MEX 190. We were lucky. When we arrived, the gates to the church patio were open to me for the first time. This was my fourth visit in recent weeks. Inside, I said hello to the man who was doing his church volunteer service. 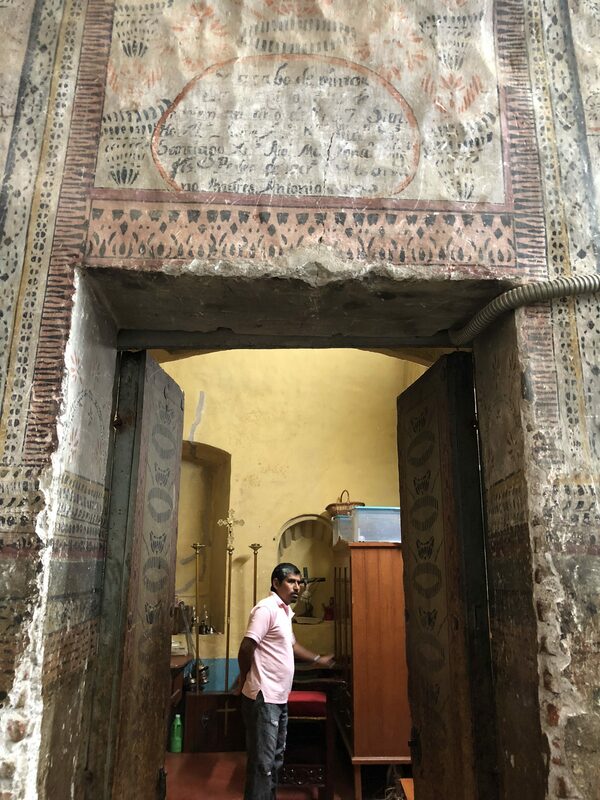 I asked him if we could step up to the altar and then enter an anteroom where there were reliquaries and antique treasures from centuries past. He welcomed us. Invited us in, told us to take our time. 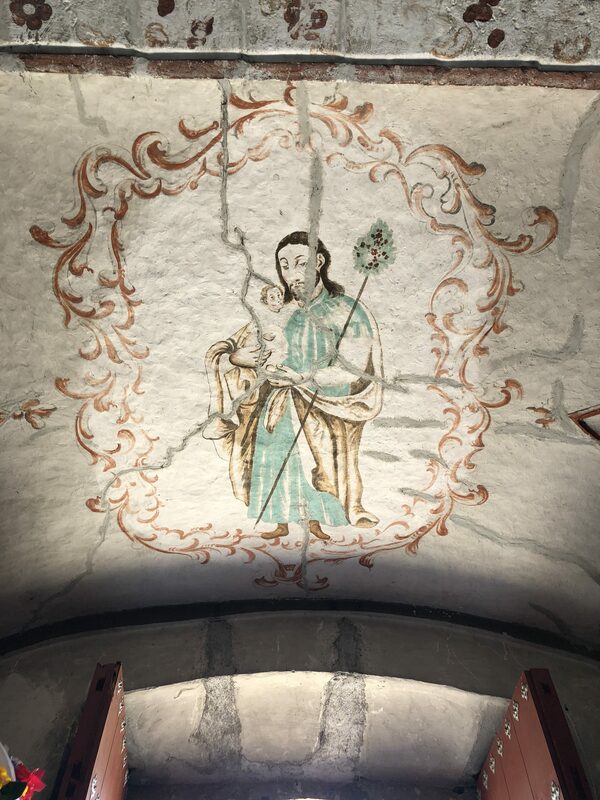 Ancient frescoes were painted on lime plastered walls. Deeply carved wood embellished Zegache-style mirrors. 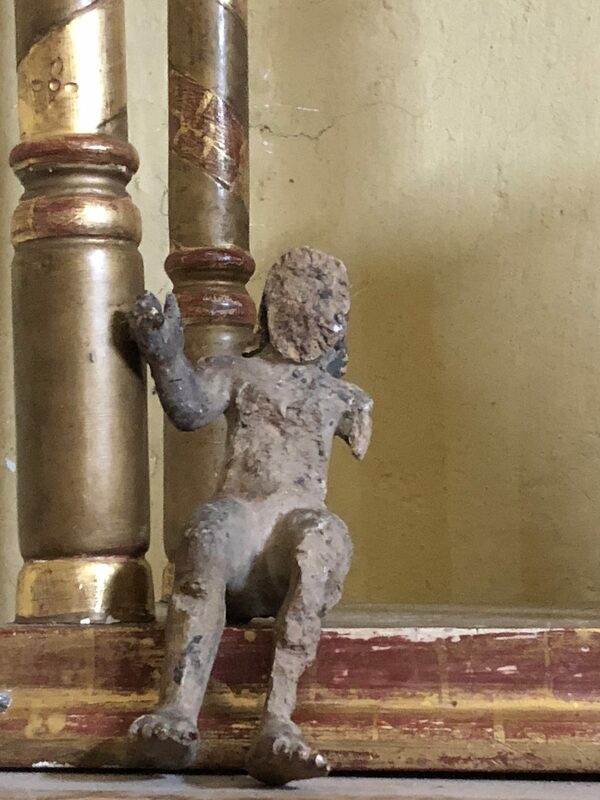 A broken clay figure perched under a gilded miniature pergola. Priestly robes hung in a glass case. It was a feeling of old, mystical, medieval. Without restoration, the space felt even more sacred. 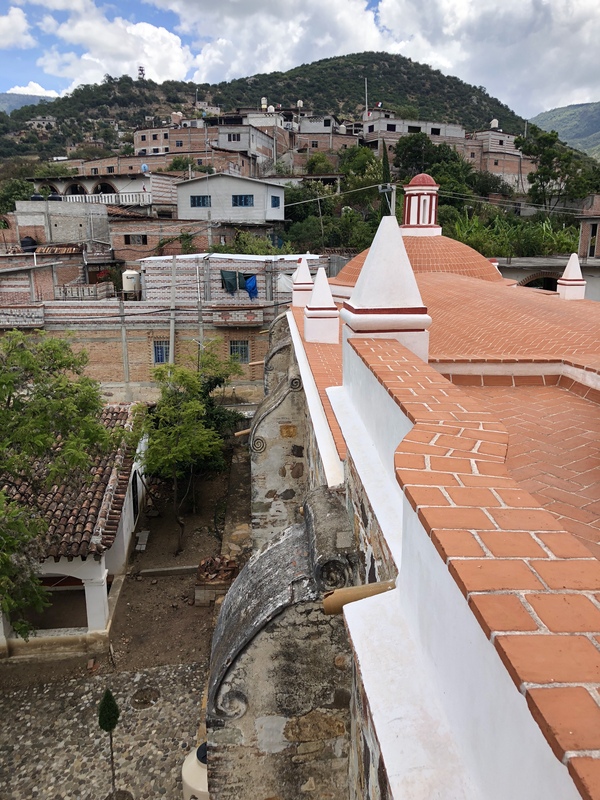 I explained to Lupita that it was her people, the Zapotecs, who were conscripted to become stone masons, wood carvers and painters, doing the labor to decorate these buildings of the new religion after the conquest. This was like being inside a fortress, sturdy, solid, everlasting. 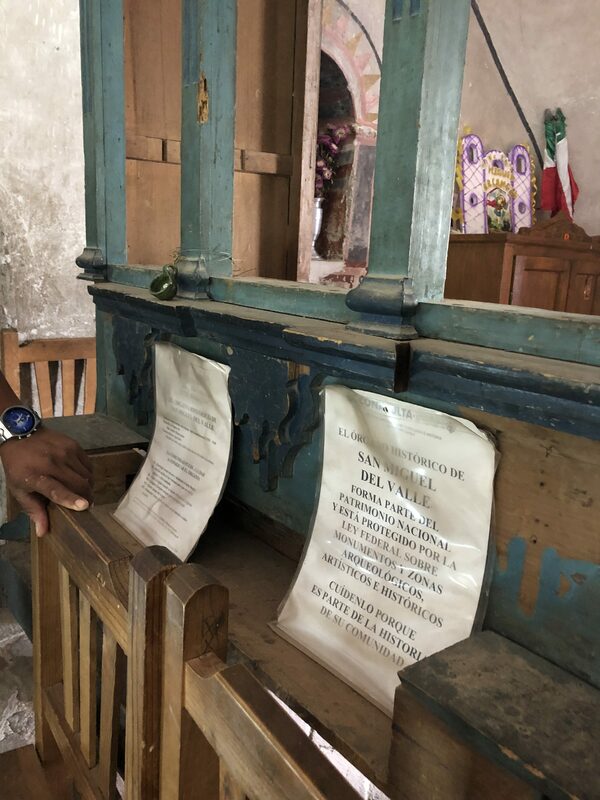 Antonio asked if we wanted to see the antique organ from the same era as the one in Tlacochahuaya. We would have to climb the narrow winding stairs up the turret to the second floor. He went first. The organ was a wood frame with no musical parts. It must have been splendid once. 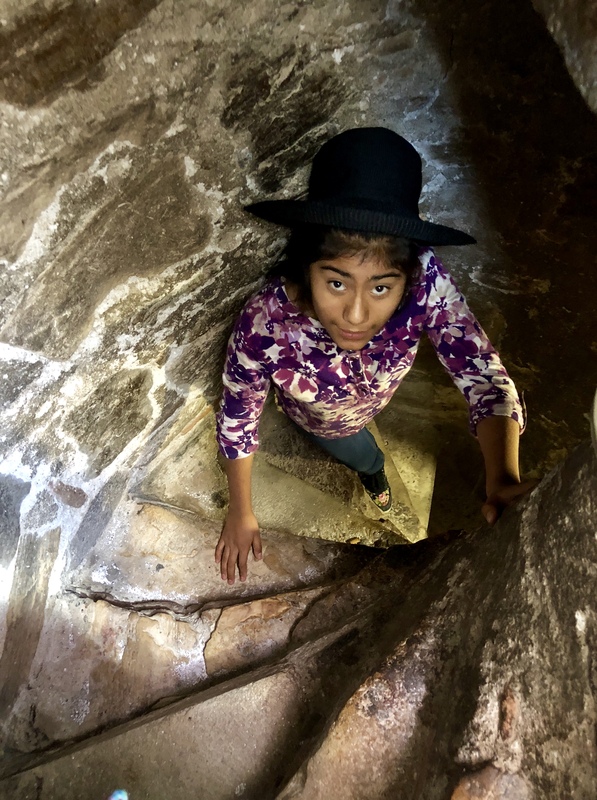 Lupita makes her way down steep stone steps. I follow her. He kept looking at his watch. I have to go ring the bells, he said. It’s noon. So we scaled another round of steps to the top of the bell tower, greeted with spectacular views. Antonio rang the bells announcing to the entire village it was twelve o’clock. Then he gave me an interview. He lived in Pomona, California, working as a landscaper for 10 years. He is happy to be home in his village! 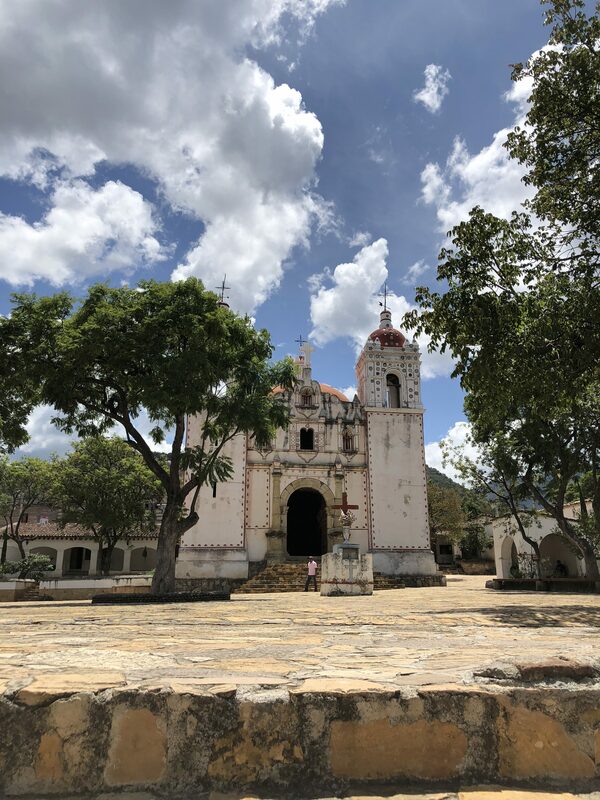 This entry was posted in Cultural Commentary, Oaxaca Mexico art and culture, Travel & Tourism and tagged bell tower, campanario, frescoes, San Miguel Arcangel church, San Miguel del Valle. Bookmark the permalink. Wow! Thanks, as it’s been closed both times I’ve visited. Love this, Norma. I’m so looking forward to my time in Oaxaca …and Michoacán ! Lovely post and video. 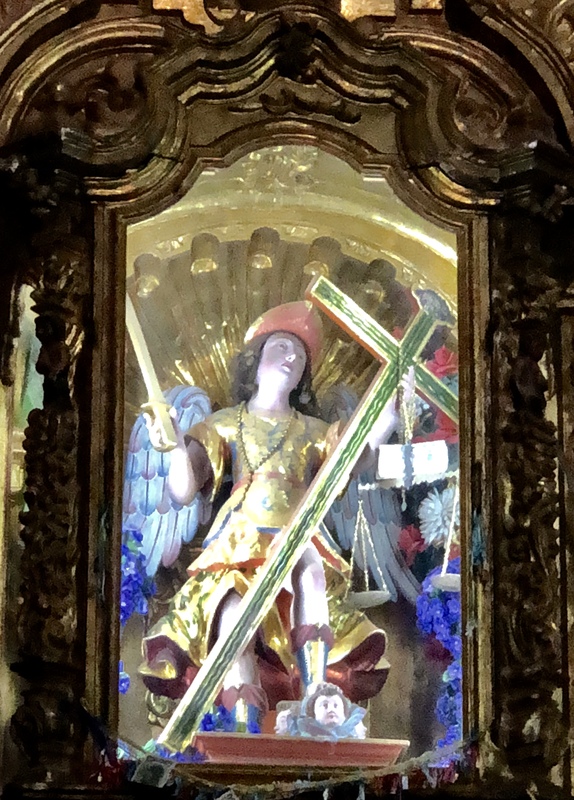 I personally could not go up those heights, but would like to visit San Miguel del Valle, a place I’ve never been, but I’m intrigued to see the church. WOW Norma – what a great adventured you just shared! Up to the top of the bell-tower is always a bit challenging but worth it. This bell-ringer Antonio is just the’ humilde’/humble person that makes a visit to Oaxaca so wonderful. Thanks for capturing this in your lovely video. I have to go get a ‘fancy apron’ when I return in January. Yes, you must get a fancy apron and I will take you there!. My thighs suffered the stress the climbing those nearly impossible stairs for two days after, but it was definitely worth it. We are both Las Grandes Fuertes! Besos. Thank you for this. 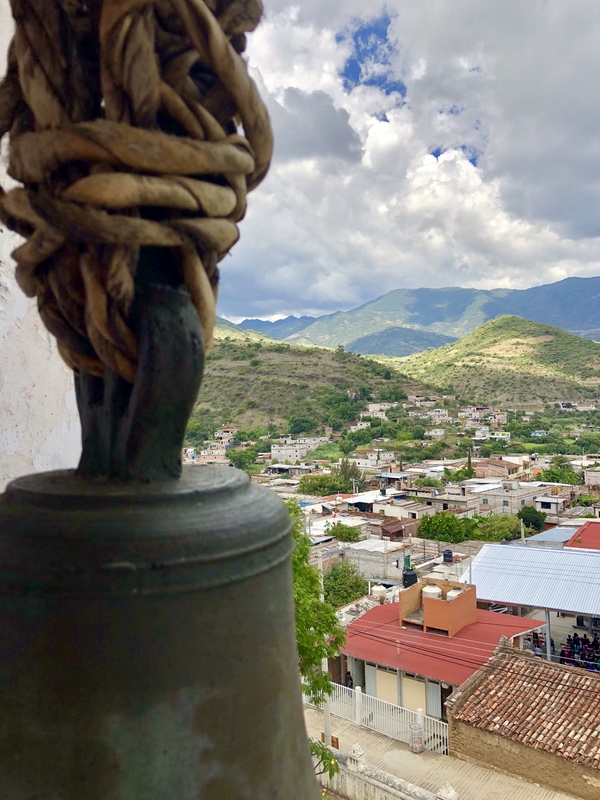 I spent a week in Teotitlan Del Valle and enjoyed the bell ringing from the church. However, I figure you have to be a local to know what the different combinations of chimes mean. It was great to see a close up video of it being done. Thanks, Nancy. I’m trying to use video more to give more of a “live” feel for place. I love how if a door is open you enter! Lupita has a great guide. Never hesitate! 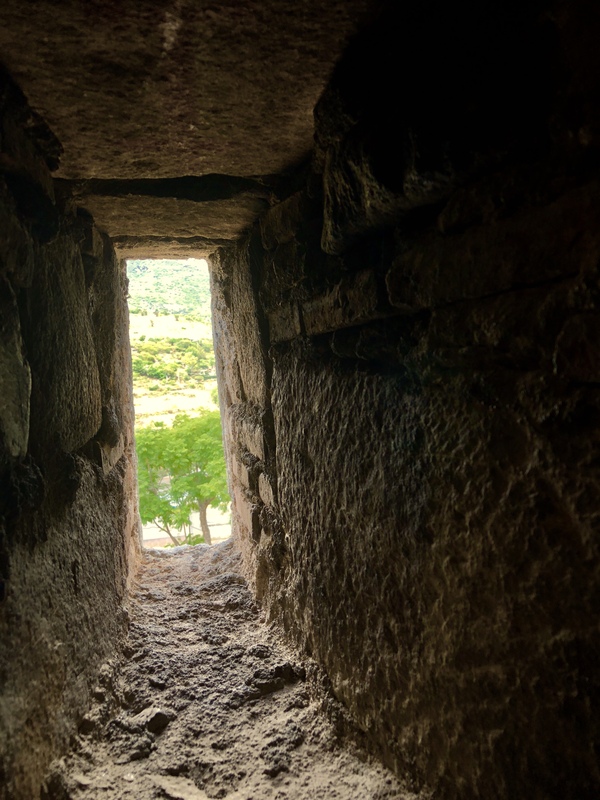 There is a discovery around every nook and cranny! Saludos, Linda. This is so beautiful! I thoroughly enjoyed it. Thank you Norma! Wonderful photos. It must have been a bit dicey going up and down those stairs. Hi Jill. My right knee held up fine. That is the replaced knee. My thighs were sore for 2 days after! Quite an adventure. Lupita was scared. I said, Let’s go!